Cashmere is a deep topic for me, a woman living in a region (Southwestern Ontario) with general climactic ugliness at least half the year. When I rise and put on a cashmere, I can face icy winds, clammy offices or sleet-hammered streets secure in its protection. Shreddy, shapeless cashmere is an affront to a northern person's equanimity. Read this terrific piece on cashmere quality, written by SimplyCashmere with an understandable bias toward Scottish product. Finally, a solid technical explanation of why a top-quality cashmere is still a luxury purchase, and why so much cashmere disappoints. Pills are the bane of cashmere; the effect irks anyone who's dropped serious coin only to end up looking like she's wearing a nonpareil. High-quality cashmere can last decades, if the moths don't attack. 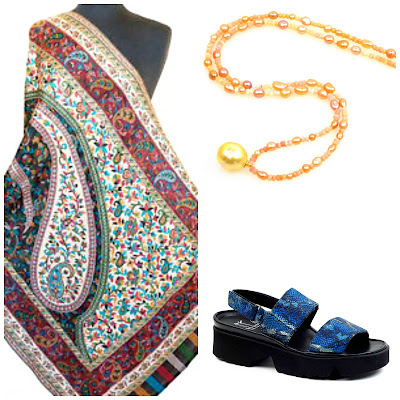 Below, special pieces offered by innovative makers. With one exception, prices are high, but as SimplyCashmere's cri de coeur reminds us, one fine sweater is worth a stack of shreddies. 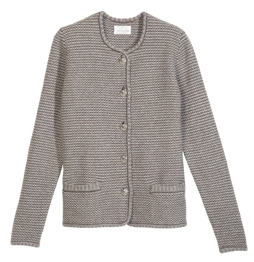 Eric Bompard's tweedy cardigan in pepper brown and feather gray, a Chanel look, but in a lush, substantial 6-ply knit; price, €368. If you're a hard to fit size, or long for something unique, visit Belinda Robertson's site and select Black Label, her bespoke service. From the regular (White Label) collection, this chic Jacket with Patch Pockets, price, £290. Ballantyne are famous for quality and for intarsia styles, as well as classics. 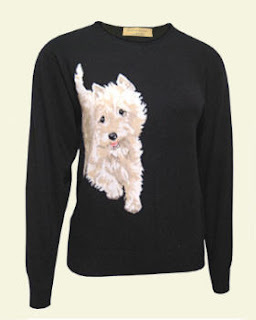 If you are a dog lover, you will warm to this Westberk style, available by mail from Berk Cashmere. The price, a significant £693.40 (exclusive of VAT) reflects the technical demands of the technique; the Ballantyne intarsias are prized by aficionados. The Italian house Marlowe does not sell online; they have boutiques in Toronto, Chicago and San Francisco. Like their nearly-homonymous countrymen Malo, their pieces are treasures– so I wanted to show this cashmere and feather sweater for inspiration. No idea how to clean it, but there must be a way... perhaps I'll have to stop by the local shop to ask. Why are J. Crew among this chi-chi crowd? Because they offer some superb designs for the price (though the quality varies). 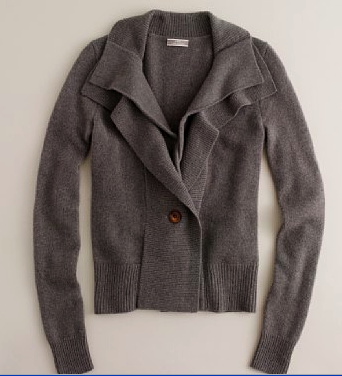 Their Elette cashmere cardigan features a double-funnel neck collar that folds up or down; price, $225. Even if you are in a warmer climate, you may find as the years pass that cashmere makes sense. Your body temps fluctuate, and air conditioning can bother you more than it used to. No more hot flashes– and I don't miss those– but I'll welcome the "warm flash"– the soft cuddle of cashmere any time. Thanks for your well researched post. I too love cashmere and on your advice recently purchased my 1st Eric Bompard scarf. It's delightfully cozy and saturated with a rich burgundy color. I'm wearing it to New York tomorrow. Excellent post, and fabulous choices here! There's really not much that's a lovely as a great cashmere piece. Yes, even here in LA there's a need for cashmere. I've tried on a couple of Bompard pieces but they tend to run rather long on me. (I'll be featuring one of their scarves in tomorrow's blog post.) I've also had good luck with Pure Collection out of Britain; their pieces are reasonably priced and the quality seems to be quite good (not quite Bompard level, but neither are their prices). Pseu: Ordered one Pure sweater and returned; weird cut, much bigger across the back than front. Quality was only OK. There are some short-bodied Bompard pieces (check out the bolero! ), the web site gives width and height measurements for all sizes. M: A cashmere scarf is one of life's most dependable pleasures, bon voyage! Well put! I wear cashmere a lot even though I'm in the southern US. Here, a good casmere sweater is just enough to get by on a chilly day. My taste tends to run toward vintage, so I'm always looking for wonderful old Pringles and Ballentynes. And thanks for the link to the cashmere site. 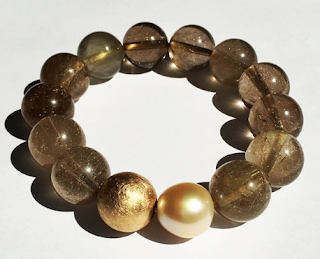 Duchesse, here's a link to the Queen of Cashmere's interview on the same topic. She explains her thinking on Scottish vs. Italian cashmere, etc. Sorry about the self-link but it's valuable information, I thought. http://amidprivilege.com/?p=1017. Helpful, informative piece, but I admit to being most impressed by how smoothly you slipped in the potentially unwieldy adjective "near-homonymous" to link Marlowe and Malo. Really, how often does one get to work that into one's patter?! Well done! LPC: Thought of this post as I wrote and am happy you linked to it for readers here. All cashmere knowledge is useful! materfamilias: Thank you, that *is* an adjective. I, too, wear cashmere in all but the most humid months. Today I am wearing a sweater that is somewhat rough. Hmmm, I take the labels out of everything I wear (too itchy as well) and I am thinking this must be a blend that should have been in another pile. The 'out' pile! Lizzie: Vintage can be of better quality and much of it looks barely worn. The advantage of new pieces is in new knitting processes and spinning techniques that were unknown then. Demi-pointe: Some is far softer than others. As LPC's link points out, Italian designer cashmere is amazingly soft, but pills easily. I usually avid too-soft cashmere in stores, the kind that looks furry. The Scottish style is harder-finished amd to smeone accustomed to fluffy cashmere, takes getting used to. Sometimes cashmere is mislabeled; Lands End got caught selling sweaters as cashmere, and the product has none in it. Demi-pointe; Sorry, should say Lands End "HAD no cashmere in it" at the time of that scandal, for which I cannot find the citation. Now, find LE OK for basics, but uninspiring re the ooooh factor. Besides starting with the best quality you can afford, the other key to making cashmere last is care. Don't overclean it -- I don't take mine to the dry cleaners at all -- and if you're hand-washing, use really gentle soap, such as Eucalan, which also has the advantage of not needing to be rinsed out. And even though the end of cashmere season is a long way away, remember not to put any animal fiber (wool, silk, mohair, cashmere, etc.) away dirty. It's the dirt and body oil that moth larvae feast on, and you don't want to overstock the buffet. Thank you for this...as a cashmere lover and wearer I can never have enough knowledge...I have learned the hard way that I must research cashmere brands before purchasing. This post just made me add new cedar balls to the drawer with my ONE cashmere sweater. I've come to cashmere late and just purchased my first piece last year. It's a coral to pink turtleneck and I have enjoyed it. i purchased it from Worth. If you are curious about their things, go to : www.worthny.com I enjoy their things because I can purchase a capsule wardrobe at one time. Today we are leaving on a short trip and I have pants, turtleneck, short sleeved sweater, and two jackets (one indoor, one outdoor) that all coordinate beautifully. I have recently been thinking about cashmere. I have a twice-worn White and Warren sweater that looks like I used it to clean the carpets, it has so many pills. Frustrating. Great topic, Duchesse! I've been a cashmere addict since I went off to college with a couple of my mother's 1950s Pringles as security blankets. I'm embarrassed to say how many I have now--but I do wear all of them, and they make me very happy. Even department-store sweaters (often on sale after Christmas) will be finer and softer in the lightest colors, for the reasons explained in the essay you linked to. And for real bargains, check your local thrift shop. Very high quality cashmeres are often donated when they have a tiny moth hole or two. I buy these, wash them immediately, (to get rid of any lingering moth activity) and when they are dry, I darn them with a light touch and ordinary sewing thread to match--from the inside of the garment, no knots necessary. On small holes in inconspicuous places, this method works like a charm, takes only a minute, and gives you a beautiful, wearable sweater for a few dollars. I usually wash my cashmeres with plain shampoo, and find that they get softer and nicer over time. I deal with pilling by drawing a natural bristle hairbrush from bottom to top of the garment before laundering; in my experience it's harmless and effective. I love these luxury lessons. I only have one cashmere sweater at this time, a vibrantly cherry red 1940s fitted "sweater girl" piece, I think it must be Scottish. I want to note here (as a knitter) that what people tend to think are moth holes are actually carpet beetle damage, so prevention and treatment should be done accordingly. Essential to fill the tub *very full* for amount of sweaters and use a strong mesh lingerie bag. I only dryclean wovens (shawls, scarves), always wash knits. re moth issue, see post under Cashmere label. 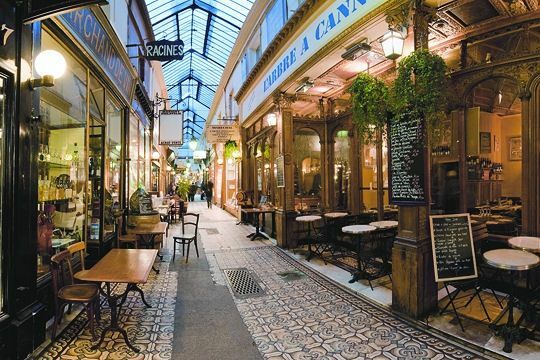 Susan: Thanks for the link, a source for a capsule wardrobe will be useful for travelers. Anonymous: Lacking your skill, I take my holes to a treasure of an invisible weaver, it's magic what they do. spacegeek: Have not been impressed with the W&W I've seen- stylish but not great quality. But even high end can pill. And then- I have J. Jill cardi (consignment purchase) that doesn't at all, go figure. Someone: Thank you, yes carpet beetles have a good appetite too! - Use baby shampoo or cashmere wash (such as The Laundress)-not Woolite; about 2 caps per sweater for normal soil. - Air dry flat, patting gently to shape if needed. I have 3 cashmere sweaters bought by my parents At Harrods about 30 years ago. They are still going strong. For Ballantyne and Pringle sweaters, you might try vintage stores. I worked in one long ago and we had tons of them. I'm always shocked by how slimy most new cashmere feels. Question: is pilling a sign of inferior weave or quality? Frugal: It's the quality of raw material (best cashmere has long and thick fibres, as described in the article) and then in the carding and spinning of the yarn, before that yarn is even knit into a sweater. The old pieces are classic- but if you want the newer styles and effects, you are looking at current production. Problem is, the flood of $100 cashmere makes people think prices of top quality pieces are too high- but they are not. Hope: My hunch is that in many styles, XXL. How to be sure: Go to the EB web site and you will see, in the listing for every garment, a little red "What's my size"? Click on that and you will see length and width measurements for all sizes. IMPORTANT: the width and length will vary from style to style for say XL or XXL. The best bet is to measure a similar garment you already own to compare. You can order a catalog (Request Catalog feature on site) to get a card of wool samples, very nice to for deciding, but you might not get that in time for this sale. EB has vastly more selection, more current styles and more colours than Mount Cashmere. I have never worn Mount so can't speak for quality. I find the styling classic, and far prefer EB's palette. There's this EB colour called python grey this season- you can't see it on the site but it has tiny, tiny flecks of red, indigo and gold in it. It makes the grey breathe. My son ordered a hat in it. Ha, if we could convince doctors to write prescriptions for cashmere sweaters rather than hormones, all menopausal women would be ahead. Another wonderful post. Mmmm I adore cashmere. I love the sweater season upon us for that obvious reason. Would you consider doing a post about how you organize your closet? I seem to need inspiration in that area as well. Anonymous: Closet organization is really a matter of not having too much in it. Now that I finished the Express Checkout experiment, I keep maybe a third of what I used to fit into my closet. I rotate seasonally, using the closets in my sons' rooms to store my off season things. Since fall-early spring is one long cold season here, I also rotate midway through winter, cleaning and storing some things in mid-Jan. or so. Otherwise my closet is too full and spring cleaning too onerous. I'm devoted to multiple skirt hangers, the pinch kind, and it's very difficult to find these in specialty closet stores or department stores.